Which seems to fit what we see on the courts: good servers go mostly for the corners. But what about the returner? Well, once the server has “balanced” his options, it doesn’t really matter what he does, as each choice has an expected payoff \(\lambda\). If the server has not, for instance setting \(q_0 + q_2 = \lambda - \epsilon\), then setting \(p_1 = 0\) would maximize the returner’s payoff, raising it to \(\lambda + \epsilon/2\). Not a good deal for the server. where \(\delta(i,j) = \alpha\) if \(i = j \pm 1\), \(\beta\) otherwise. Again, \(q_2\) is proportional to the returner payoff. No choice for the server but to give up on the body serve. 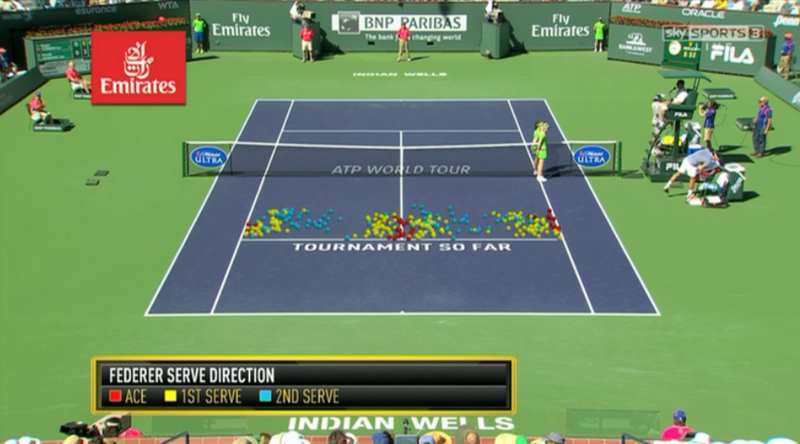 In hindsight the intuition is simple: of the serve directions available, the body serve is the only one defused by two of the three available return positions. That’s the reason why \(q_2\) plays a special role in the above equations. But this intuition is not readily accessible to somebody as knowledgeable about tennis as Boris Becker, despite the available strong evidence from multiple players. He’s not alone. A google search for “is the body serve effective” returns pearls of wisdom such as “The Most Underused and Underrated Serve”; “The most effective and underutilized serve in doubles”; “Serve to the body for safety”. While the model discussed here is highly simplified, it isn’t immediately clear how additional realism would restore the body serve reputation. For instance, on slower surfaces a fourth option for the returner is to drop backwards, which also defuses the body serve by allowing more time for the returner to coordinate. It seems more likely that the best players are abandoning the body serve in response to a moving target, the returner. Much is said about the role of technology and physical preparation in driving changes in the game, but technical changes are highly underestimated in my opinion. Players are using grips my teachers would have banned as conducive to fractures, and switch them with great variety during play, hitting the ball at any height. Squash shots (extreme defensive slice hit with reverse-side grips), open stance backends, sliding on all surfaces, jump shots, 360s (returning to the central position after a corner shot by turning one’s back to the net), playing way behind the baseline and dynamic return positions, the list could go on and on. Players are not leaving any stone unturned in their quest for tennis glory. May mathematical models and data guide their efforts.